Rotating the light switch turns the lights on and off, regardless of the power model setting. If you leave the power mode in VEHICLE OFF (LOCK) with the lights on, a light on reminder chime will sound when you open the driver’s door. When the lights are on, the lights on indicator in the instrument panel will be on. Repeatedly turning the headlights on and off reduces the life of the HID headlight bulbs. 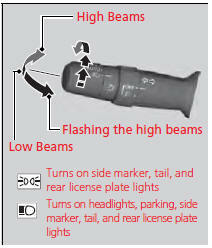 If you sense that the level of the headlights is abnormal, have the vehicle inspected by a dealer. Do not leave the lights on when the engine is off because it will cause the battery to discharge. Your vehicle is equipped with the automatic headlight adjusting system that automatically adjusts the vertical angle of the low beam headlights. If you find a significant change in the vertical angle of the headlights, there may be a problem with the system. Have your vehicle checked by a dealer. Automatic lighting control can be used when the power mode is in ON. When you turn the light switch to AUTO, the headlights and other exterior lights will switch on and off automatically depending on the ambient brightness. You can change the auto light sensitivity setting. We recommend that you turn on the lights manually when driving at night, in a dense fog, or in dark areas such as long tunnels or parking facilities. 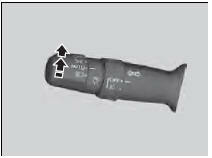 The light sensor is in the location shown below. 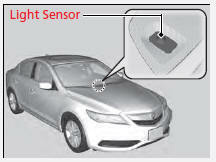 Do not cover this light sensor with anything; otherwise, the automatic lighting system may not work properly. The headlights automatically come on when the wipers are used several times within a certain intervals with the headlight switch in AUTO. The headlights automatically go off a few minutes later if the wipers are stopped. This feature activates during the headlights are off in AUTO. The instrument panel brightness does not change when the headlights come on. When the ambient light is at dark, the automatic lighting control feature overrides, and the headlights come on with or without the wipers sweeping more than several times. The headlights, all other exterior lights, and the instrument panel lights turn off within 15 seconds after the door is opened and closed with the power mode in VEHICLE OFF (LOCK). If you set the power mode to VEHICLE OFF (LOCK) with the headlight switch on, but do not open the door, the lights turn off after 10 minutes (three minutes, if the switch is in the AUTO position). The lights turn on again when you unlock or open the driver's door. If you unlock the door, but do not open it within 15 seconds, the lights go off. If you open the driver's door, you will hear a lights on reminder chime.